As Evacuation Orders Lift, Some Paradise Residents Return Home To Devastation Part of the Northern California town obliterated by the Camp Fire was reopened Wednesday, allowing people to return and see what is left of their community. 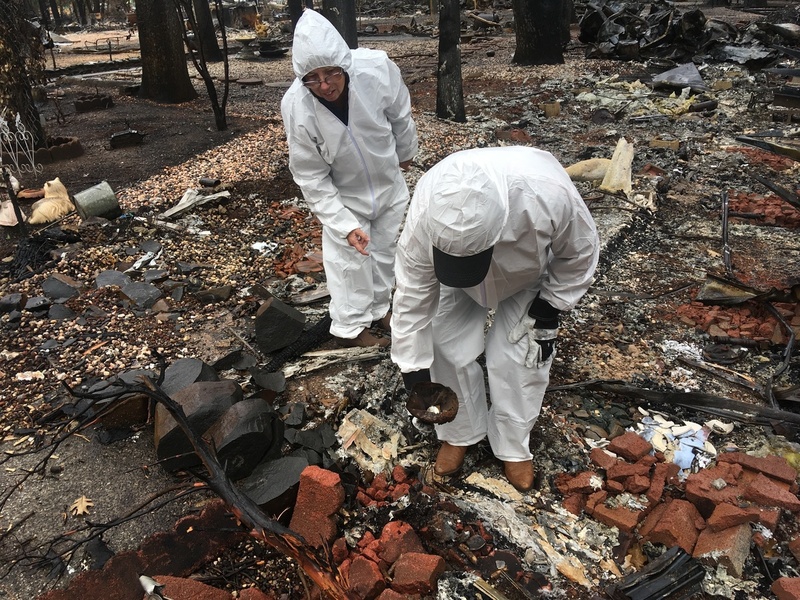 Jerry and Joyce McLean, wearing hazmat suits, look for sentimental items as they sift through the remains of their home Wednesday in Paradise, Calif. The wildfire — California's deadliest and most destructive — killed at least 85 people, forced the evacuation of more than 50,000, and destroyed thousands of structures in Paradise and neighboring communities. Eleven people are still missing, according to the Associated Press. Those who returned found a landscape of blackened trees and debris. Charred chimneys and strips of driveway were the only evidence that some piles of rubble had once been homes. Roberts lived in a newly renovated two-story house with his wife, Tamara, and their daughter and son-in-law. He says they had only a few moments to evacuate when the fire raced toward them last month; now they'll start digging through the ash, looking for any mementos that might have survived. Roberts hopes to find his daughter's wedding ring, which was left behind. 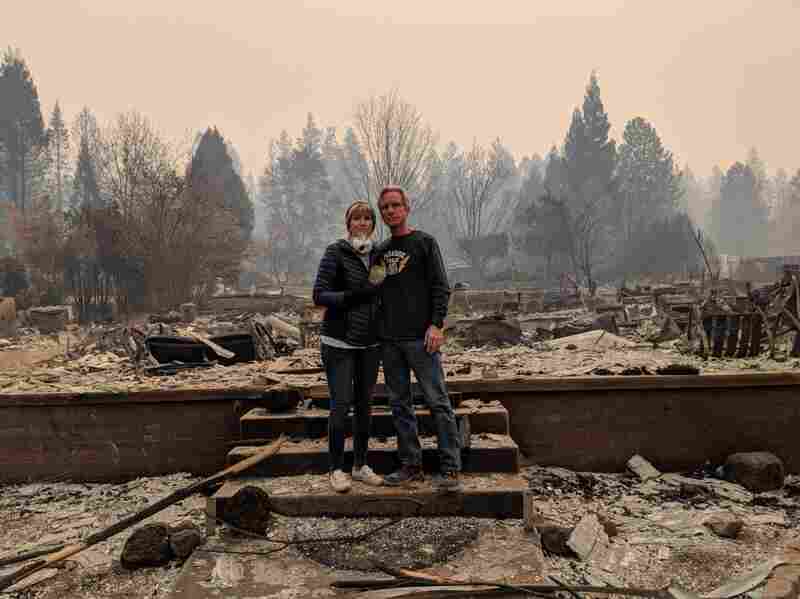 Tamara and Seth Roberts stand in front of the remains of their home in Paradise during a short visit on Nov. 10. It was destroyed in the Camp Fire two days earlier. On Sunday, residents of Magalia, which borders Paradise to the north, also got their chance to return home. "It really looks like a bomb went off," Manny Carrasco told The Wall Street Journal. "All the houses in the neighborhood were leveled. It was total devastation." Although the fire was fully contained 10 days ago, officials cautioned residents of continuing dangers. "There is evidence from recent fires in California that homes and property destroyed by fire contain high and concerning levels of heavy metals, lead, mercury, dioxin, arsenic, and other carcinogens," says a warning on the Butte County fire recovery website. "Some property may have the presence of radio-active materials." Officials said they would be distributing protective gear including full-body suits, rubber gloves and face masks to those returning. With most of the area destroyed, they also encouraged residents to bring their own food, fuel and water. The lifting of the evacuation order is an early step in the long process of rebuilding and repopulating Paradise. With so much housing destroyed, area officials say there is no clear road map for how that process will play out. Displaced residents pitched tents in a Walmart parking lot in the aftermath of the fire. And locals have been critical of the Federal Emergency Management Agency for not moving more quickly to establish temporary housing in trailers. Ryan Buras, the head of FEMA's Housing Task Force in California, defended the agency's work in an interview with NPR. "I do not believe this was a slow response," Buras said. "It's just the magnitude of this event is going to stress all of us at the state, county and federal level." On Monday, area schools restarted classes for the first time since the fire. They are being held in temporary classrooms, as well as online. But Paradise High School Principal Loren Lighthall told NPR that the loss of homes and workplaces means there are students and families who have left Paradise, and California, with no plans to return.